The machine and its maker Chas Roberts. In July 2009 I bought a Roberts Roughstuff. 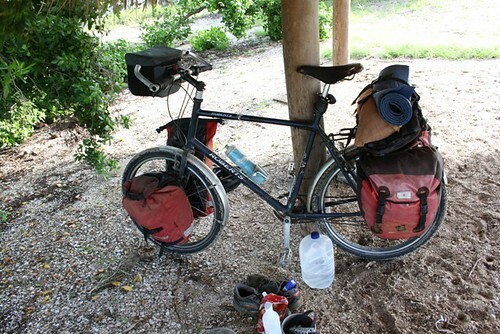 It is a steel 26" wheel tourer equipped with a Rohloff hub, Tubus racks, Brooks saddle, Avid v-brakes and Mavic rims. I'm very happy that I use a bike hand-built in the UK. After a year of constant use my bike has proven to be strong and reliable. The Mavic rims cracked in La Paz (Bolivia) and I replaced them with "Big Mamoth Fat" rims by Sunrims. Gravity Bolivia has a fantastic workshop in La Paz and undertook the work for a very fair price. Otherwise very little has happened except an oil change, a few new brake blocks and a new chain. 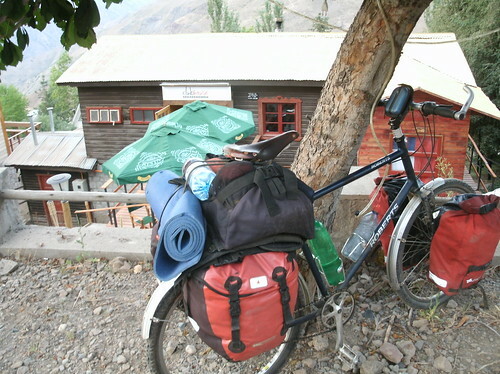 I got lots of punctures with the origional Continental tyres and they were shredded to pieces after the Careterra Austral in Chile. Local tyres proved to be fairly useless too, only lasting between a week to a month. When my mate Russ came to visit I asked him to buy me some Shwalbe "Marathon XR" tyres. These are really hard wearing and almost never puncture (only staples or very small nails seem to manage it). They are good for more than 15,000kms. The Brooks saddle is excellent. It is comfy to the extent that I don't wear cycling shorts, just normal ones. That said, it does need to be kept dry and polished which is a bummer for me as I don't have the proofide stuff I should have. Rohloff hub has not had any problems and I love it. So easy to change gears whenever you like: stationary or moving. Changing the oil is an easy enough job and only needs to be done every 5000kms or so (other cyclists only do it every 10,000km). The way the rear dropouts are arranged on the Roughstuff is clever. It is really easy to slide the back wheel back as the chain stretchs. Also, if you get a puncture it is very simple to remove the back wheel. In short, she rides like a dream and I am very happy with her. 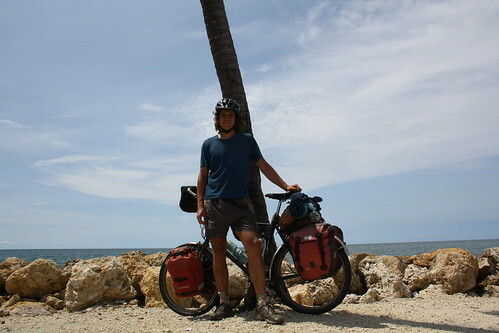 I intend to have many happy years to come exploring the world on a top quality bike. Made in London, UK! 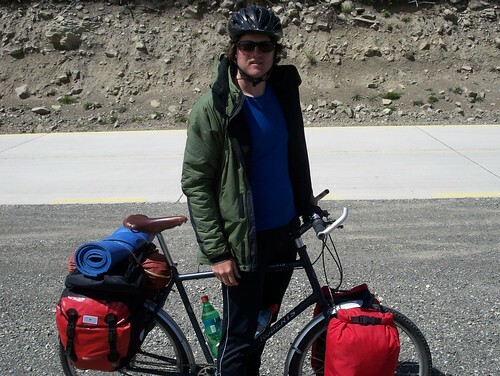 I love, amongst other things, cycling, mountains, travel and music. 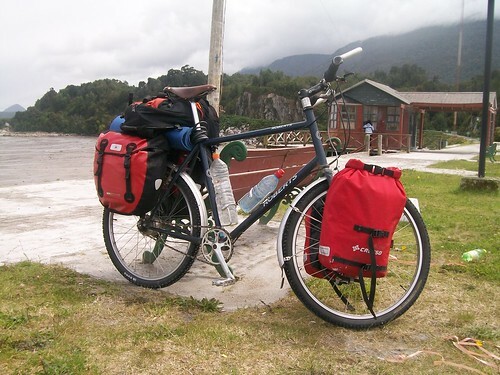 I'm going to pedal my bike from Tierra del Fuego to the Caribbean. 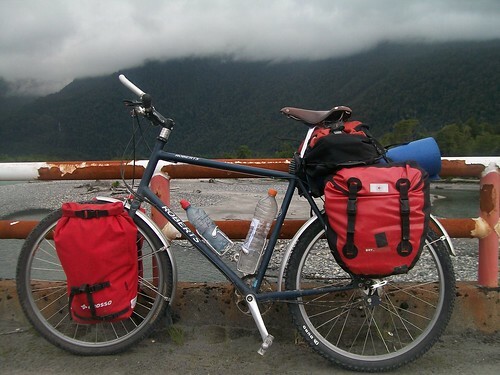 It's a cycling adventure to discover the sounds of Latin America, the continent where Tango, Bosa Nova, Samba, Salsa, Calypso, Cha Cha Cha, Merengue, Bachata, Reggae and Rumba were born. 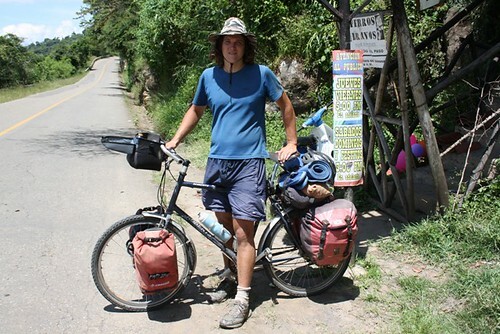 I will cover thousands of miles and face the challenges of mountains, deserts and rainforests. Along the way I will make audio recordings of musicians, singers, birdsong, crashing waves, poets, bands, insects, conversations, waterfalls, DJs, buskers, bustling market places, soundscapes, passing freight trains, storytellers and anything else that catches my ear. 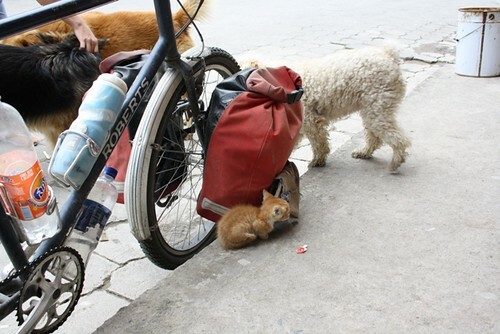 I will carry everything I need on my bike. It will be a low budget trip. I will sleep in a tent and cook on my camp stove or on open fires. I will be seeking out fiestas, festivals, concerts and carnivals, as well as looking for hidden talents and local heroes, listening to the best traditional folk music and seeking contemporary urban sounds. 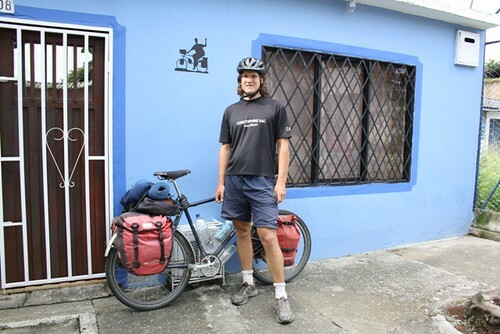 I hope to have the opportunity to talk about my trip in local schools, sports clubs and music groups, both on my trip and back home, to encourage people to cycle and to celebrate the music they love. On my return I will write a book about my travels and produce an accompanying CD with a mixture of the sounds and music I have captured. For a challenge, an adventure and for excitement. To learn to speak Spanish. To come back with a few tales to tell. To experience Latin American culture, music and dance, food and wine, history and politics. To meet interesting new people and to find out something about the world and about myself. To travel through deserts, mountains, coastlines and rain forests. Above all I want to find out what will happen if I just get on my bike and head off. There are two things which I hope to encourage and celebrate through my trip. We live in a time where practicing a musical instrument has to compete with computer games and telly. Maybe electronic music and DJing will keep musical creativity alive and fresh. The internet age has brought the music industry to the cusp of revolution. I believe the need for music is still as strong as the need for food. On this journey I will give my nose a rest and follow my ears. It is easy to take for granted how efficient we humans are. Given a glass of water and a sandwich most of us could walk for hundreds of miles. A man on wheels is perhaps the most efficient form of land transport there is. 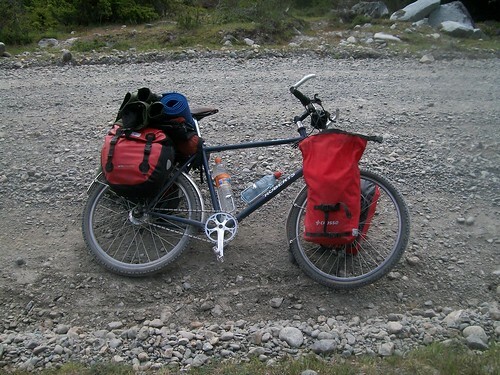 Bicycles have a minimal effect on the environment and they are cheap to maintain. Cycling puts you in touch with your surroundings and closer to the people around you. I'll be sleeping in a lightweight two man tent. Paul Passey gave it to me instead of paying me some money he owed for a hire car we shared. When it wears out I will repair it or buy a new one. In turn, I'll be sleeping in a sleeping bag and on a cheap roll mat. I will take a lightweight tarp too as an alternative. And I may be tempted to buy a hammock once things get tropical. I will be wearing clothes (mostly). I've an orange Marmott gortex jacket I'm happy with and I'll probably wear a bit of lycra too. I will be cooking on a Trangia stove (an alcohol burning camp stove that I happen to like) and hope that it'll still works ok at altitude and in cold conditions. Where possible I will cook on a small open fire. When I'm away from internet cafes I will write a diary in a notebook, but when they are available I will update this blog. I will be carrying an audio recorder and a digital camera and, I expect, struggling to charge them up. I will find my way, not by GPS, but by map and compass. Stanfords are kindly sponsoring me with a range of maps. 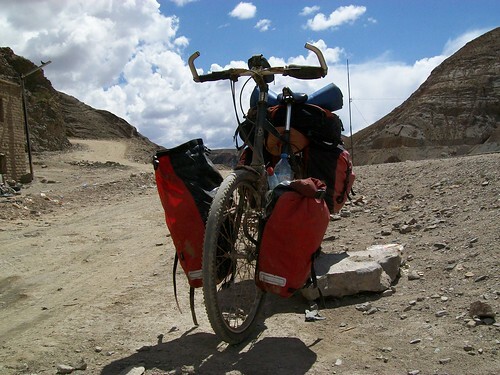 Kindly provided me with a pair of Altura waterproof trousers and a pair of their own brand Revolution rear panniers. 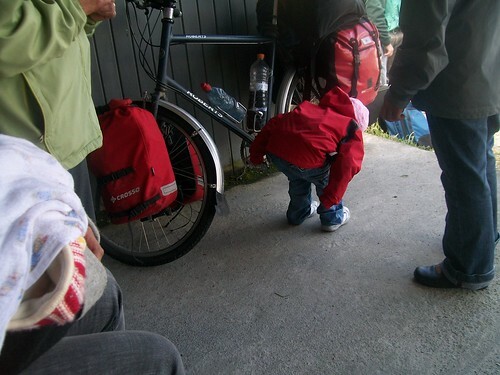 Kindy gave me a pair of front panniers and a dry bag. 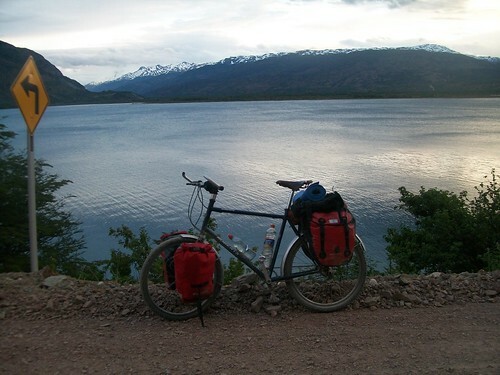 In November 2009 I will arrive in Buenos Aires and head off for Tierra del Fuego by bus. I will end up down in Ushuaia, the most southerly city in the world. From there I will cycle, you've guessed it, north. 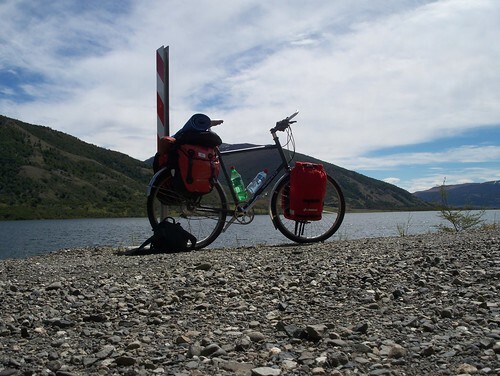 At first I will head through Patagonia where I hope I will cope against the winds. I will pass mighty mountains such as the Torres del Paine and Mount Fitzroy and visit the Perito Moreno Glacier. 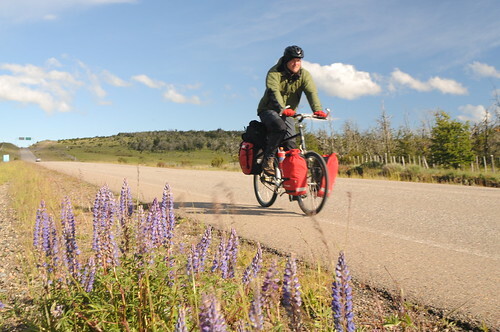 Next I will take on the famous Carretera Austral a gravel road through impressive Patagonian scenery. 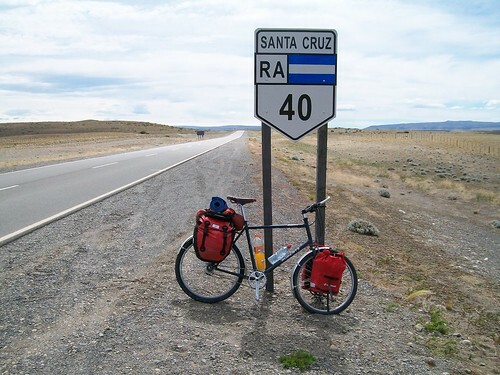 The road connects with the Panamerican Highway which I will follow towards Santiago, taking in Los Lagos Region (the Chilean Lake district)along the way. 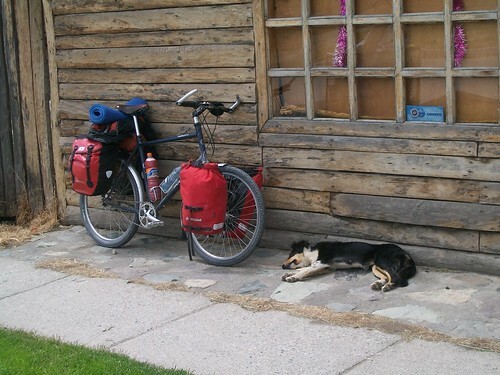 At some point I will cross the Andes into northwest Argentina and then cycle into Bolivia. I am keen to visit Salar de Uyuni the worlds largest salt flat (at over 4000 square miles) and the dinosaur tracks at Torotoro. Then I will head to Lago Titicaca and cross into Peru. In Peru I will be keen to visit the remnants of the Incas and, of course, I will head up to see Machu Picchu. I'm also looking forward to seeing the enigmatic Nazca lines. Continuing north through Peru, I will make my way to Equador and sample barbecued guinea pig, before looking for a boat ride down the Amazon into Brazil to Manus. 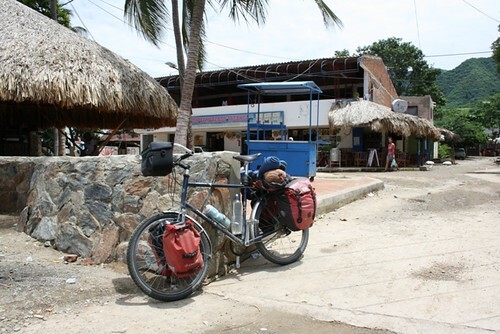 I will then use part of the Transamazonian Highway to get to Boa Vista and from there into Venezuela. I will then look for a boat ride down the Orinoco. Then I arrive on the sunny sandy beaches of the Caribbean and crack open a cold beer to celebrate. Inflatable pillow from old wine box. Just wrap a fleece round it and its perfect! In the second world war people were proud of their "mend and make do" attitude. It is an eco(nom)(log)ical philosophy we seem to have lost in these heady consumer driven days. So if you want to save money and the planet here are some tips! 1. At home you can use old coffee jars are good for storing teabags, cous cous, nuts, sugar, nails, screws and all sorts of other things. 2. Old ice cream tubs and plastic Chinese take away tubs make good Tupperware replacements. 3. Hot chocolate plastic containers and plastic soup containers are light and strong for storing pasta, cous cous, rice, or oats when hiking or cycling. 4. 2 litre coke bottles useful for taking large amounts of water. 5. Aluminium foil, or old pie tins, as stove windshield. 6. 330ml Lucazade bottle is an excellent sized water bottle for hiking and hill running. 7. 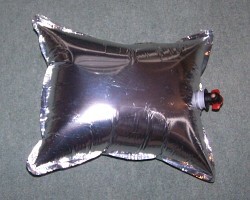 Plastic inner bladder from a box of wine can be used as an inflatable backpacking pillow, just blow into the tap. 8. Strong bin liners as extra layer on the hill, as a collapsible bucket for washing clothes, as a water carrier, for keeping your clothes and sleeping bag dry. 9. Marigolds as lightweight waterproof gloves. 10. Bubble wrap as lightweight sleeping mat. 11. Old inner tubes can be cut into strips to use as elastic bands, hair bands, repairing tent peg loops, to hold brakes on etc. 12. Old clothes and sheets can be sown into useful things like stuff sacks. I intend to add to this list as I think of more things to make the comprehensive cheapskate's guide to reuse of "rubbish" and save money buying expensive stuff you don't need. If you have any ideas or suggestions please comment away! !